Dogs & Parks, to leash or not to leash? The straight scoop! By most accounts unleashed dog activity in the American River Parkway has increased dramatically in recent years including areas such as Sutter’s Landing Park. There are ongoing complaints about encounters with off-leash dogs including disturbances, threats to wildlife, public health and safety and more. Existing rules require dogs to be on leash and controlled at all times including within parks. In spite of this conflict, very few citations are being written for those who violate these requirements. At Sutter’s Landing Park, off-leash dog activity along the river and adjacent habitats seemed to increase significantly after the City finished the nearly enclosed dog park. 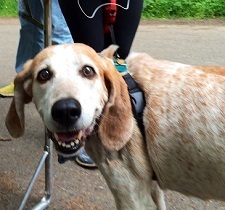 Local Sacramento area dog park information and rules follow along with a creative example from Portland’s city managed Forest Park on how to educate about off-leash dog impacts and provide incentives to do better for us to consider. Clearly the framework has been established for appropriate dog activities in the Parkway and similar areas. Could more outreach and incentive help or is it time to call for strict enforcement? The example below from Portland’s city managed Forest Park was used to educate about off-leash dog impacts and provide incentives to do so. Portland has a 5000 acre city managed wilderness park, one of the largest in the nation. This seems a very good model - its great to see fresh approaches to the off-leash dog problem and, to confirm those concerned aren’t over-reacting to the issue. 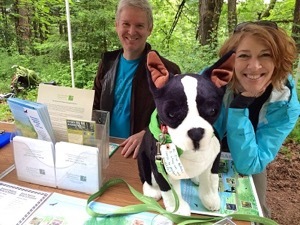 Remember: You and your dog can help protect all of our parks while appreciating them too! 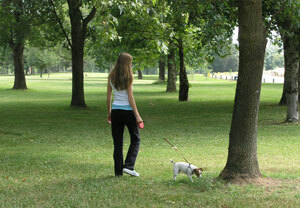 Myth: As long as it is “safe” and away from groups of people, I can have my dog off leash in City parks. Fact: All dogs are required to be on a leash and licensed within the City of Sacramento (except at designated dog parks – see list below). Did you know the City of Sacramento is home to great dog parks, with three of those located in right here in Natomas? While many pet owners can feel that under the right circumstances (few to no people around, a “well behaved” dog, etc) it is OK to let a dog run free off-leash at the park, our City code has some specific rules about what is and isn’t allowed. Letting a dog off leash is not only a risk to the safety of the public, the safety of your dog, and the security of your finances (paying your own or someone else’s medical or veterinary bill, facing a lawsuit, etc), it is also expressly prohibited under Sacramento City Code 9.44.220, which states that no owner of any animal, wild or domestic (except for a domestic cat) shall permit the animal to be “at large”, which is defined as an animal that is off the premises of its owner and not under restraint by leash, tether or adequate enclosure. Unfortunately, there have been incidents in which dogs have become aggressive, so unless a dog is on a leash, no owner can ever be sure that their dog will not attack (or be attacked) if it feels provoked. For the safety of the public and the animals, the City’s Park Rangers are fully enforcing the leash law, with financial penalties for those who do not abide by the City’s codes. The penalty for the first offense starts at $300.00. Second and third offenses are $500.00 per dog off leash and three offenses or more in a 12 months period can result in charges of increasing severity. In addition, it’s important to make sure to have your pet licensed. In the City of Sacramento, a pet owner is required to purchase a license for a dog or a cat that is 4 months of age or older. According to city code 9.44.490(A), a license authorizes a person to own, harbor, and keep a dog or cat within the city limits of Sacramento. You can mail your application to the shelter or you can go in-person to the shelter’s Reception Center at 2127 Front Street, Wednesday – Sunday from 9:00 am – 5:00 pm. Half of all licensing fees collected at the shelter are then dedicated to a special fund that may only be used for the City’s low income spay and neuter program. If you are licensing your pet for the first time, you will receive your pet’s license tag by mail or in-person. If you are renewing an existing license, you will simply re-use the original tag. If you have lost your pet’s tag, we can issue a replacement tag for $5. Also, if you stop by, ask about micro-chipping (just a one-time fee of $20, which includes the microchip registration) to help keep tabs on your four legged friends in case they get lost! So make sure to keep your dog licensed and on a leash, even if you don’t see a sign posted at the park you may be visiting, and if you do see someone with their pet off leash in a non-sanctioned area such as a dog park, pick up the phone and dial 3-1-1 (or 916-264-5011 from a cell phone) so that a Park Ranger can be dispatched to address the issue. All department of parks and recreation dog parks are fenced, with a double-gate system for safety. Dog owners can test their arm strength and even use tennis ball launchers to get their dogs active and running in a safe and fun environment. Parks include: benches, shade areas, drinking fountains for dogs, and plenty of room to run. Dogs of all sizes are welcome. Attention: Grand Opening Event Flyer! The small dog park is 0.21 acres, and the large dog park is 1.34 acres. Both dog parks contain turf areas. Two acres are available for large dogs over 25 lbs, and a half acre for small and timid dogs. This 2.5 acre Park includes areas for large & small dogs. The small dog park is 0.54 acres, and the large dog park is 2.0 acres. Both dog parks contain turf areas, benches, tables and dog drinking fountains. Dog owners/handlers are personally and legally responsible for their animals. You are using these facilities at your own risk. Dogs may be off a leash only within the designated fenced area. Owners/handlers must clean up after their dogs. Dogs must have a current license, license must be on dogs' collar, the collar must be on the dog. Aggressive dogs are not allowed. The owner/handler of any dog exhibiting aggressive or unruly behavior are required to immediately remove the offending animal. 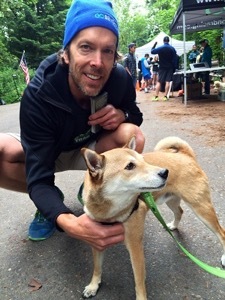 For every two dogs brought to the park, there must be at least one owner/handler. Children less than 14 must be accompanied by an adult. Female dogs in season are not allowed at the facility. "In summary, people and their dogs disturb wildlife, and people are not always aware of or willing to acknowledge the significance of their own impacts. Wildlife perceive dogs as predators. Dogs subject wildlife to physical and temporal displacement from habitat, and dog scent repels wildlife with lingering impacts. Dogs disturb wildlife which can induce long-term stress, impact animals’ immune system and reduce reproduction. Dogs spread disease to and outright kill wildlife. People with dogs are much more detrimental to wildlife than people alone; off-leash dogs are worse; and off-trail impacts are the highest." Hint, lots of reasons not to from someone who knows why. This year Metro's Central Enhancement grant is funding our efforts to raise awareness around the impact of off-leash dogs on the environment. 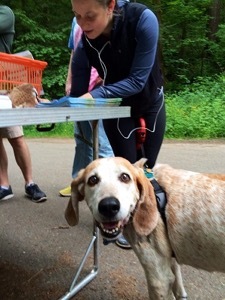 Park goers who encounter our community outreach volunteers and pledge to keep their dog on-leash in Forest Park take home a free Forest Park leash for their dog to flaunt on trail.